Color schemes and configuration choices blend acoustic performance with esthetic considerations. Panels which are heat resistant to 480°F and withstand continuous exposure to 300°F temperatures. Panels rated Class I to comply with Code requirements for specific room occupancies requiring non-combustible construction for flame spread, smoke density and fuel contribution. Panels with a permeable membrane to withstand damp environments and permit ready cleaning. Panels which can be painted to match room design and decor. 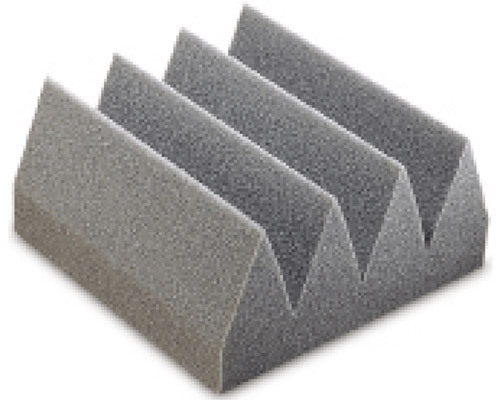 Hanging baffles highly effective in reducing reverberant noise in large rooms with hard surfaces such as firing ranges, auditoriums, swimming pools, and athletic courts. 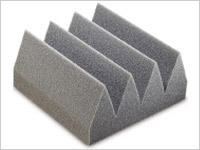 Standard anechoic wedges for broad band and low frequency sound absorption and requirements.